Rural Metro Fire reports eight deaths so far this year. There were four all of last year. TUCSON, Ariz. -- Pet deaths from house fires are spiking this year, according to the Rural Metro Fire Department. 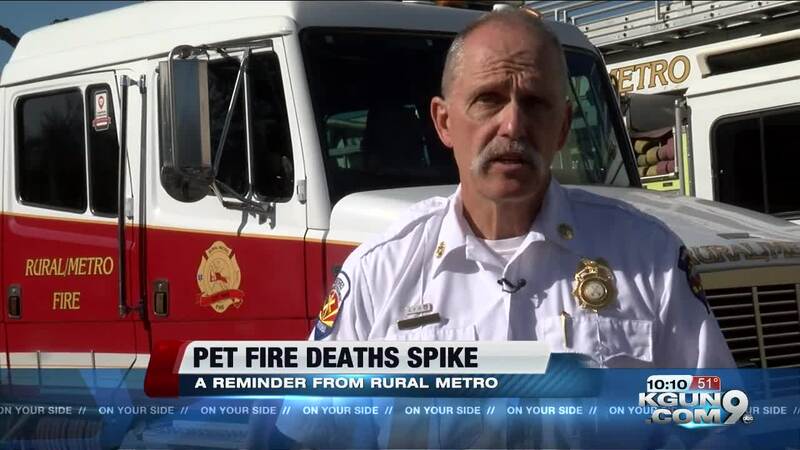 Battalion Chief John Walka says Rural Metro Fire is reporting eight pet deaths so far this year. There were four for all of last year, Walka says. But the reminder from Rural Metro is not just about pet deaths. One dog was burned in a fire last year, but is doing well today, Walka says. Keep your pets on a leash or keep them in your arms when you evacuate a house fire. Why? The reason is unexpected. Rural metro says if you have a pet door, some people think that's a good escape method. But when a fire erupts, so does the chaos and frantic behavior, which can scare pets. "That dog will want to return to his safe place that usually is inside of the home, not realizing that the house is on fire. He thinks that's the safest place for him to be and they don't understand that. So, we have seen dogs and cats even that will run back into a burning house only to die," Walka said. Get rid of any open flames in your home when you leave, including space heaters. Get rid of, or unplug, any loose electric wires. Pets like to chew on them sometimes and it can spark a fire. Be careful with stove handles. Gas or electric ones, Walka says he has seen some pets accidentally turn on the stove this way, causing fires. "We want to help people keep their pets safe," Walka said.